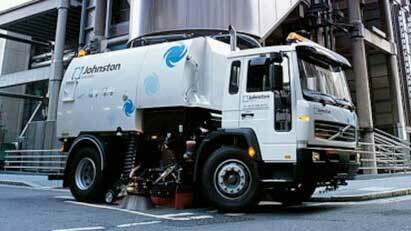 If you're in the market for a street sweeper, you'll want to check out the machines produced by Johnston Sweepers! Johnston Sweepers is a wholly owned subsidiary of Bucher Municipal and our North American hub based in Mooresville, North Carolina. Founded in 1904, Johnston Sweepers is the world leading manufacturer of outdoor surface cleaning equipment – street sweepers. 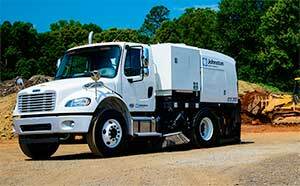 Johnston Sweepers offers five different models of chassis-mounted sweepers as well as a compact sweeper model. Click on any of the photos or model numbers, below, to see more information on that model at the Johnston Sweepers website. The newest member of the Johnston Sweeper family is the, “ES351 Easy Sweep, ”a four wheel, mechanical sweeper. A proven single engine design that blends a superior collection of features which provides ownership advantages such as the tightest turning radius in the industry and a stainless steel hopper with a Lifetime Warranty. Our latest V Range sweeper, the VT651, is the result of over 50 years of evolution and continuous improvement. The V Range has established itself as Jo hnston's most reliable and dependable truck-mounted sweeper. The new VT651 is the natural evolution of the hugely popular outgoing VT650 model, incorporating literally thousands of customer-led design upgrades as part of Johnston’s commitment to customer feedback and design excellence. The launch of the all-new VT651 follows three years of intensive design and testing by Johnston’s engineering team, which has involved re-examining every single component of the V Range to bring the clever new sweepers to market. Equally at home on municipal street cleaning or extreme heavy duty work sites the V Range delivers consistently high pick-up performance – even on contractor duties such as road planing and dirt pick-up around construction sites and access roads. 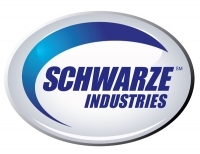 Lower alternative fuel costs and lower incremental maintenance costs can save valuable dollars. Government incentives and Infrastructure Tax Credits may be available to green fleets that can help reduce acquisition costs significantly. Available in dual or single sweep configuration, the maximum 3.6m swept path ensures superb coverage per hour – and with high capacity hoppers, water systems and fuel tanks, the V Range is designed to stay at work for longer. Mounted to the subframe, the hydraulically operated sweeping system is designed to prolong the life of the brush and reduces the cost of ownership. Both channel and wide-sweep brush installations feature quick-change mechanisms which reduce downtime between changeovers. 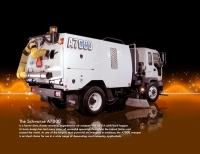 The RT655 provides cost effective, efficient road sweeping. Regenerative air circulation allows for large forward facing digger gutter brooms and a full width suction to maximize sweeping speed. Combined with ergonomic operator controls and low running costs, the RT655 provides an ideal solution to long low cambered roads and urban environments. In addition, the RT655 is perfectly-suited for airport applications and is utilized World-wide in this capacity. Click here for more information regarding Airport Applications. The new C201 combines high productivity and high performance with low running costs and low environmental impact. The four-wheel-steer option, allows the smallest turning circle in its class, and superlative maneuverability. Wide view floor-to-roof heated windscreen with unrestricted all-round vision. Enlarged glass floor panels on both sides of the cab to view brushes and nozzle box. An audible signal for safe reversing, with standard Night Silent switch. Brushes have variable speed, and both have independent pressure control. 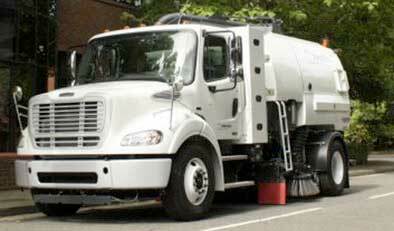 We invite you to visit the Johnston Sweepers website for complete information about any of our sweepers. You can also determine your closest JohnstonNA dealer, as well as arrange a personal demonstration of any of our world-leading power sweepers.